The Cincinnati Bearcats got their first win over a game Connecticut Huskies squad in controversial fashion Wednesday night. Lance Stephenson drew a foul call on Gavin Edwards with .7 seconds left in a tie game and went to the stripe and won it for the Bearcats. There was some dispute that the official made the call after the buzzer, or that Edwards didn't foul Stephenson, but John Cahill said he did, and that's all that matters. The Bearcats get their first win in conference play, and their 9th of the season. It drops UConn to 9-3. 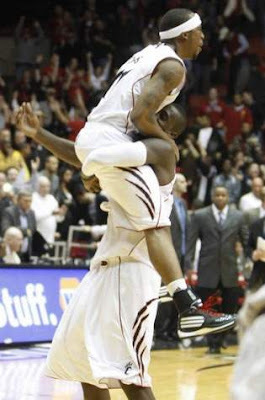 The big story of the night for the Bearcats was Lance Stephenson. #33 scored 21 points, 1 off his career high, pulled down 4 rebounds and had 3 assists. Stephenson was the offense down the stretch and made things happen to get the win. Lance had a number of moves that left one wondering how he could be stopped. He pulled off a crossover fadeaway jumper off glass, another crossover pull up, and a drive where he went right at one of the UConn big men, missed, but got his own rebound and put it back. He pulled down a rebound and went coast to coast, drawing a foul. Lance has matured since the UAB game. Deonta Vaughn broke out of his slump with 17 points, 5 boards and 5 assists. Vaughn did most of his damage in the first half leading the Cats to a double digit lead. Deonta also made some history. He passed Field Williams and moved into second behind Lazelle Durden for second all time in 3 pointers made. Congratulations Deonta. Yancy Gates didn't do much with only 6 points and 3 boards. He did have 2 blocks. Ibrahima Thomas pulled 9 rebounds, 3 offensive, had 2 blocks and chipped in 6 points. None bigger than his dunk to give Cincinnati a 3 point lead with 17 seconds left. Larry Davis was big down the stretch when the offense sputtered, and had 9, but scored 7 straight at one point. For Connecticut, Jerome Dyson and Stanley Robinson poured in the points with 24 and 20 respectively. Dyson was everywhere when the Huskies needed him most, and Robinson made big shot after big shot. Gavin Edwards had a solid 8-7, doing most of his work at the free throw line. Kemba Walker struggled on 3-13 shooting and finished with 9. Alex Oriakhi was a monster on the boards with 9, 4 offensive. Jerome Dyson really stood out though. He had 7 rebounds, 3 offensive, 5 assists and 2 steals. As for the game itself, it was a game filled with lots of ebb and flow. The Bearcats would at once be dynamite offensively, and then go minutes without scoring. The Huskies would fall behind double digits, and rally. The game was as physical as one would expect Big East basketball to be. In the first half, both teams came out tight and scoring was sparse. 7 minutes in, UConn was 4-15 and UC 3-11. That would quickly change. Deonta Vaughn hit 2 3s in 29 seconds to break the UC lead to 8. Stephenson would go coast to coast for a lay up and get fouled to put the lead at 11. The Cats scored 16 points in 3 minutes. They would only score 6 more the final 8 minutes of the half. Jerome Dyson seemed to get right down the middle of the lane on every play and UConn cut into the 12 point lead. Stanley Robinson had a 3 point play on a lay up right down the middle and UConn only trailed by 1 at the half, 36-35. Dyson had 14, Robinson had 9 for UConn. For the Cats, Stephenson had 12 and Vaughn had 10. The second half started with Cincinnati busting right back out to a double digit lead. Steve Toyloy of all people nailed a jumper and a free throw to get things started. Deonta Vaughn hit a 3 and after 5 minutes, the Cats lead by 10. UConn cut it back to 5 after Stanley Robinson made the first of only 4 UConn 3s. Rashad Bishop only had 6, but he made a 3 to put UC back up 8, only to foul Robinson as he made a 3. The game stayed close until Larry Davis got involved. Larry hit a 3, got a lay up, and scored on a runner to put the Cats up 10. Lance Stephenson got his first bucket of the half to put UC up 12 with 9 minutes to go. UConn would make a run with Robinson's 3rd 3 pointer, and buckets by Dyson and Walker to get the lead to 5. With 4:27 left, Vaughn picked up his 4th foul on a push off. Vaughn would stay on the bench as the Cats had a couple of turnovers, capped Dyson stripping Bishop and slamming home a dunk to cut the lead to 4 with 2:27 left. Vaughn would only last a minute longer before fouling Gavin Edwards and UConn cut the lead to 3. Dion Dixon would run the point, as he did when Vaughn left the game. UC would struggle to get a good look, and the ball was deflected into the back court. The officials generously give UC 1 second to shoot, and Yancy Gates missed an open look when the Huskies doubled Stephenson. UConn would miss their shot, but Ibrahima Thomas couldn't pull down the rebound, nor could Dion Dixon, who had it taken away by Dyson. Dyson fed Robinson and the Huskies were down 1. UConn wouldn't be able to foul and the Cats broke the press leading to a Thomas dunk and the Cats were up 3 with 17 seconds left. Larry Davis started off on Kemba Walker as the point guard raced up the floor, but Davis went with Dyson and no one was around a wide open Walker who tied the score with 9.4 left. The Cats didn't call a timeout. Stephenson worked around Dyson and drew the foul mentioned up top. Despite being told to miss the second, Lance would make it and a Dyson half court shot would be off and the Bearcats would win. I take detailed game notes. The positives in this victory were Deonta Vaughn shaking his slump, Lance Stephenson finally getting a game winner to go after misses against Gonzaga and Xavier, Ibrahima Thomas on the glass, and the defense once again. UConn shot 37.5% and 30.8% from 3. The Cats also didn't get a shot blocked by the nation's leading shot blocking team. The first time UConn didn't block a shot since January 30, 2001. Damn. The Cats shot well with 41% and 46.7% from 3. They even made free throws 14-19 73.7%, highlighted by Lance going 7-7. The negatives weren't many. 16 turnovers are too many. The Cats also got in foul trouble. Dion Dixon and Yancy Gates got in it in the middle of the second half, and Vaughn at the end. The Cats also gave up 15 offensive rebounds on 40 UConn misses. 37% is too high, even against a great rebounding team. All in all, it was a great win for the Bearcats. What's your reaction Larry Davis?